The Beach Cannon's Secret is the second episode of Pinna Park in Super Mario Sunshine. The episode's objective is to enter the cannon on the beach and clear the secret course, which has a unique background drawn in the style of Super Mario World 2: Yoshi's Island's graphics. The cannon on the beach. 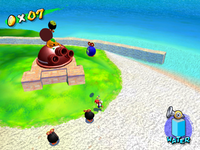 During this episode, a Monty Mole has taken over the cannon on the far end of the beach and has attached Bill Blasters to the front. The Monty Mole will constantly fire Bullet Bills of different types at the player: standard Bullet Bills, Purple Bullet Bills, and Gold Bullet Bills. If Mario gets close enough to the cannon, the Monty Mole will begin throwing Bob-ombs, though getting too close will make the Monty Mole hide in the cannon. To defeat the Monty Mole, the player has to spray a Bob-omb and then pick up and throw it at the Monty Mole. Doing so three times will defeat it and the player can enter the cannon. Upon entering the course, Shadow Mario will appear and take F.L.U.D.D. away. The Beach Cannon's Secret course is filled with disappearing platforms the player has to quickly run over. The first set of green platforms disappear in sections, indicated by being colored darker until they disappear completely, then reappearing a few seconds later. The Yoshi Egg-styled platforms will not disappear. The next platform goes two directions: forward or up. Moving along the green spotted platform leads the player to a wall that sends out Strollin' Stus, and jumping up the trampoline platforms will take the player further along the course. Next are two sets of red disappearing platforms, though these platforms disappear one after another. The player has to rapidly dive in order to cross the platforms, and moving to slowly will cause Mario to fall. For the first set of platforms, Mario will fall to the aforementioned green spotted platforms if he isn't fast enough, but for the second set, Mario will fall into the abyss, losing a life. The second set also has a bend the player needs to adjust their dive on. At the end of the red platforms is the Shine Sprite. This page was last edited on January 28, 2019, at 22:19.